Hot on the heels of Me Made May comes a new monthly challenge, this one for kids. June has become Made for Kids Month courtesy of Liesl (Oliver and S) and Rae (Made By Rae). 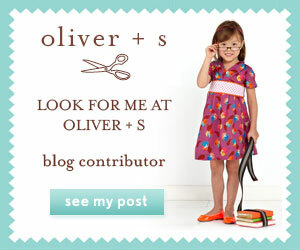 See the Oliver and S blog post here to read up on the basics. I have wanted to participate in Me Made May but I really wouldn't last very long. There are only 4 items of handmade clothing that I regularly wear out of my wardrobe and I am pretty sure I would get sick of those in heavy rotation! Maybe if I got my arse into gear and sewed more pretty things for myself I could actually take part. 2015? I shall make it a goal. L wears her Clever Charlotte Finch Shorts. A favourite pattern of mine. This pair went unphotographed and unblogged. I think I made them last summer when she was still a bit too small for them. These are in a burgundy twill fabric. Boo has on her much loved Jump Rope dress. This was my first ever JRD and I love love love the style. I have made school dresses out of this pattern but really should get around to making another one for home. She has gone up a size and the bodice is getting a wee bit too tight. L is in her new Clever Charlotte Raven Jeans (which were a dry run for size checking) and a Sweet Pocket Pinafore from Heidi & Finn. It was the start of the school week (so most of her handmades will be the same school items from now on). She wears her Oliver and S 2+2 skirt. A tshirt with eternal fitting powers is the Crossover Tee from the book Growing Up Sew Liberated. This just never seems to get too small. A new school dress, hot off the machine. The Jump Rope dress in view b. This one has eluded me for a long time, I just couldn't get around to making one. I really like the one piece body to the dress and the pockets are really cute. If I had to do a comparison with the view a version, I know she can get this one on and off again easier. The bodice isn't as tight to peel off as the other one. I could send her in on a PE day with no worries. But I do miss that bow and the gathered skirt of view a. What can I say, I love them both! A Heidi & Finn top today, this one the fairly new Tulip Tunic. The band on the bottom always wriggles up over her bottom but other than that, this is pattern well worth getting. I have plans to try the dress version soon (some Kitschy Coo knit fabric stashed away just for the task). Also here is the backpack from Little Things To Sew. Just the right size for a nursery day. Hands down the Oliver and S pattern that sends my heart a flutterin'. The Puppet Show. This has lasted her a very long time and I am so glad she still fits in the size 2T because that gives me plenty of time to still use the pattern. We adore this Kwik Sew Nightie. I have made two versions (see here for the other one) and it is in heavy rotation. She just loves them. Even though this is flannel and we are edging into warmer weather, it still gets pulled out of the drawer. I am not blatantly sponsoring Tangle Tamer, you know when you just have to give them something to stay still enough for a photo? This is one skirt that makes me smile. It is from Sew Chic Kids book and we love it. It is the Tiered Skirt. Great for summer with sandals! A day off from school uniform! L wears her Oliver and S Tea Party Dress in Japanese linen. Layered for a stormy day. So there we have it. A whole week full of handmades. The flickr pool and instagram feed are filling up with lots of lovely and inspirational items. Within the group of friends I have in those places, it is lovely to see the clothes that get worn (not just photographed) and the everyday life that goes on with them. If you are taking part, hope your children are wearing your clothes with pride and you are getting a little boost out of seeing them in them! What a great week of clothing! I especially love that first jumprope dress. So gorgeous! 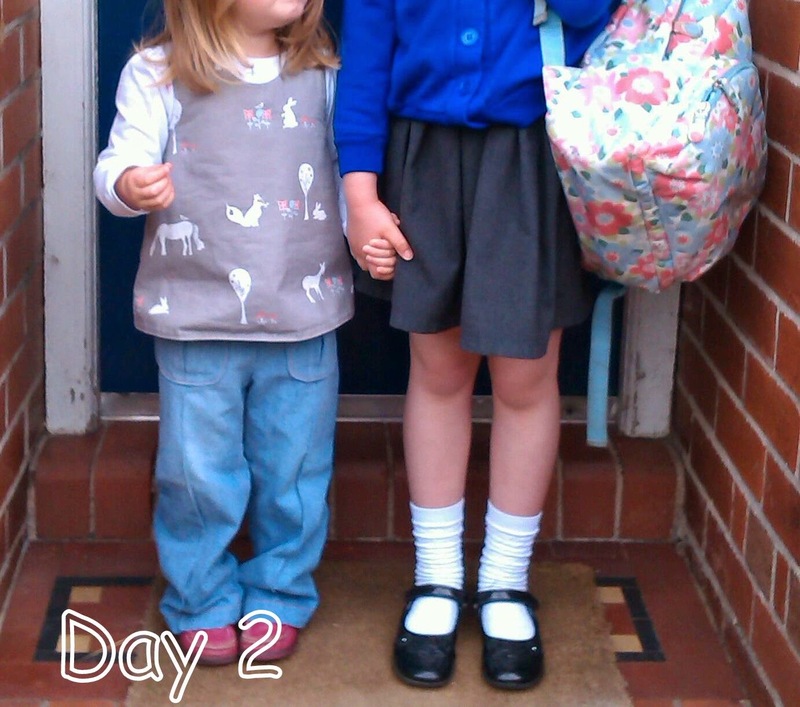 This week my daughter wore the same skirt three times, so I think some skirt sewing is in order soon. I have a couple O+S patterns and then I should trace out that tiered skirt since yours is so lovely! I love your circle skirt! I should really make one. If it keeps getting worn that speaks volumes. They are all such beautiful clothes. And that spotty jump rope dress is especially gorgeous. Thank you! I have just put away 6 dresses (!) that are too small or the wrong season. I need to get the gap in her wardrobe filled up again. Such beautiful clothes, and you are right; it is so nice to see them wearing their clothes everyday rather than just being photographed. I was really up for this challenge and started well but after MMM I just ran out of steam on abut day 3 and didn't actually get round to putting photos up! Well done for the commitment! I'm loving seeing your pictures in Flickr each day. My kids are 90% handmade every day but I just can't organise myself to snap the pictures. I appreciate your efforts! I'm with on me made May, may be next year, hey? Thanks Shelley! Taking photos with my phone isn't as hard work as setting up the shot with a DSLR. I just snap and use whatever I end up with. Cindy mentioned this as well. It seems a more relaxed way of doing it and probably why I am managing to get one a day. So MMM 2015 then? Lets do it! I love seeing all the handmades in every day use and not just staged blog pictures. :) You also quickly see which pieces are favorites and worn more than once. I love, love, love the Puppet Show top! The puppet show is my favourite and I should make more while the pattern still fits. I have never made the dress version yet. So I'm finally getting around to reading your blog post a bit late - I'm enjoying the same thing about Made for Kids Month as you -seeing the clothes/kids in their natural habitat! Thanks Janice! Doing this has made me realize what she actually chooses to wear of my handmade stuff (and what she needs more of) Boo is definitely a dress girl.